Make on Monday and eat for the rest of the week! I love it when I find a recipe that is not only easy, but healthy and delicious too! A week or so ago, I was looking for an easy chicken recipe that I could set and forget in my crock pot. Why is it that I only seem to use my crock pot during the winter months? Summer can be crazy too! 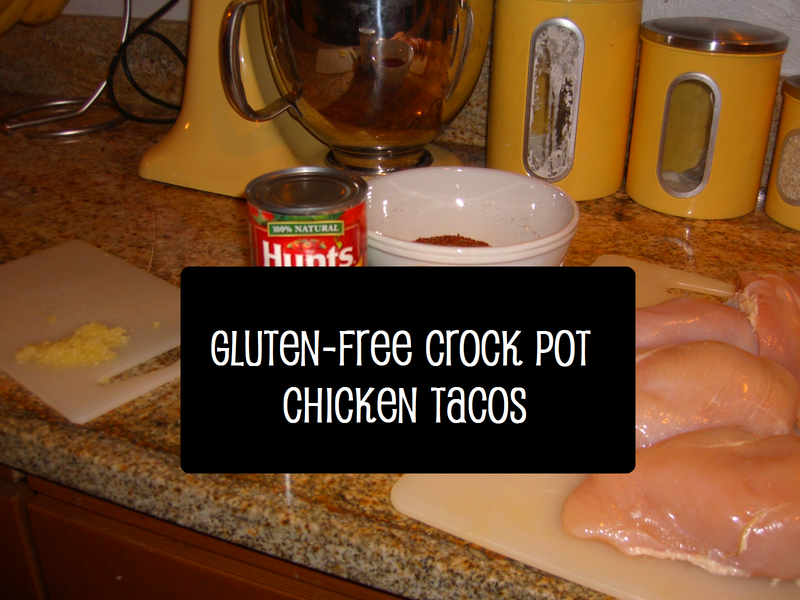 I came across a chicken taco recipe on Valerie’s Kitchen. Not only did I already have everything for recipe in my pantry, but the leftovers lasted my husband and I for four days, providing many quick lunches and dinners! I adapted the recipe a bit based on what I had on hand. I also added a couple of extras that add a little extra flavor to any dish, garlic and diced jalapeno. I collected the basics first: 2 cloves garlic (minced), 1 can of Hunt’s diced tomatoes, 1 can of diced green chilies, 1 medium onion (finely chopped), and 4 chicken breasts (trimmed of fat). Next, I created the taco seasoning for the chicken. This is where you can really adapt the flavor to your taste. In a pinch, you can use the pre-made taco seasoning packets, but by making the seasoning yourself, you can monitor the level of salt added, and insure everything is gluten-free. You can try out the mix that Valerie’s Kitchen suggests here, or you can create your own based on your preferences. The best part about making your own is that you have leftover seasoning ready to go for your next Tex-Mex or chili recipe! I added cayenne pepper to my mix for an extra kick. Ignore the dog desperately asking for some of that chicken breast. Sorry Peanut, not today. Place your chicken breasts in the slow cooker, and sprinkle on 3 BIG tablespoons of that amazing seasoning you just made. Top the chicken breasts with your minced garlic. Now, dump in your onions, tomatoes, and diced green chilies, juice and all. Add in some diced pickled or fresh jalapeno for some extra flavor and spice. Set your slow cooker to low, and forget it for 6-8 hours. * I found 7 hours to be the sweet spot. While you wait, enjoy a nice walk with your dog and go about your day. Or in my case, enjoy a few moments without Peanut reminding you that there is something delicious cooking in the kitchen, and he would like some please. Once you’ve reached 7 hours, shred the chicken with two forks, place on to some warm corn tortillas, and top with all your favorites. I chose lettuce, reduced fat sour cream, smoked cheddar cheese, and fresh avocado! Yum! Place chicken on the bottom of your slow cooker. Sprinkle seasoning over chicken breasts, and add in minced garlic. Pour in tomatoes, diced green chilies, onion, and jalapeno. Heat tortillas and top as desired. Previous postBefore Summer Is Over…. It turned out really well. It was one of those recipes that seemed to be even better the next day! Yes I am sure and I love those kind of recipes that are better the next day.